The last time I blogged was on my birthday, and just like that an entire month has passed. During that month I started a new job and moved the baby off to college. Oh and I have begun the daily 50 minute one-way commute which will be the inspiration for future blogs titled Life in the Slow Lane: Lessons Learned on I 85. Watching for upcoming posts including Tie Your Hospital Gown before Walking in a Crosswalk and Size Matters: Why the F150, not the Prius, Rules the Road. But I digress. In spite of what many think, reading is not dead with the next generation. Reading critically, however, is a skill that is diminishing. People in general, not just students, are reading more digitally, scrolling through feeds and quickly deleting information that does not hold their attention. I consider myself a seasoned reader and struggle more and more with concentration and the tenacity of fully considering a text. Critical reading requires careful consideration of a text while taking time to self-question and draw conclusions. Critical reading allows for time to engage and interact with the text. Critical reading embraces and encourages struggling with and through a text. This past week in my writing class, I asked students to let me check their food narrative papers before submitting them online. When I checked student D’s paper, I asked why she didn’t make adjustments after conferring on her draft. “Oh my God, Mrs. Barber. Why you have to be so extra? Just tell me if this is good enough to pass.” (This student and I have a good relationship so don’t read into this comment disrespect. Unless you’re teaching high school, the tone of comments like this are difficult to explain). I told her that this writing is not acceptable in college. As a matter of fact, it is not even close. But more importantly I explained that she needed to adopt first-date writing and present her best self when writing for others as opposed to producing something just good enough to pass. I told her I would not accept writing that did not represent her full potential. She revised, submitted a well-written paper, and asked me if I would be coming to the football game on Friday night. Conscious writing explores writing at the sentence, paragraph, and essay level. Conscious writing embraces planning, drafting, revising, and publishing. 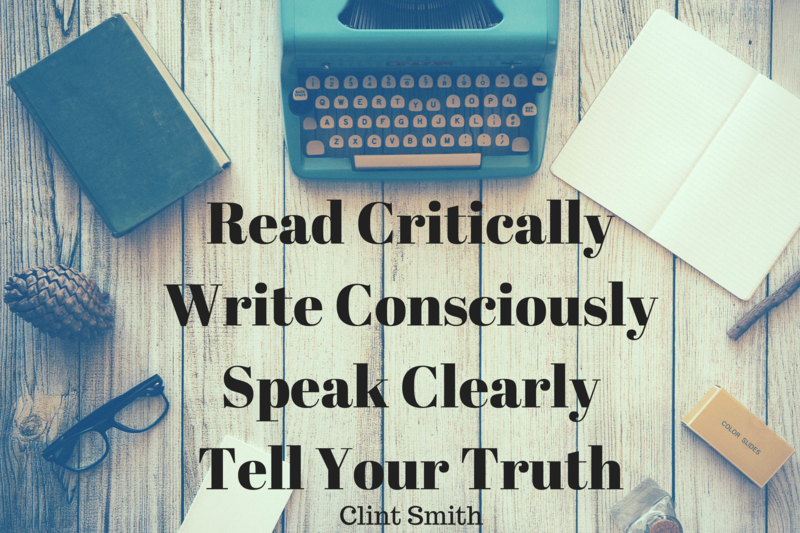 Conscious writing commits to writing for more than a passing grade. Um if you like uh want kids to mmm speak good um you will uhh have to learn them how. Clear communication is a learned skill much like reading and writing and begins long before a student opens his or her mouth. Speaking clearly begins with thinking clearly. Students must first have something to say and structure it in the most effective way then students are much more likely to speak in a clear and articulate manner. The classroom should be a safe environment for students to be in front of each other learning how to and practicing speaking; looking at your feet and mumbling is not acceptable, My father gave Scott some preaching advice before his first sermon: stand up, speak up, shut up. That’s good advice. Speaking clearly makes space for thinking before speaking. Speaking clearly provides low stakes opportunities for students to practice. Speaking clearly encourages and invites conversation. My AP students journal over the summer. This is far less about them keeping account of what they did over the summer and far more about figuring out their voice. You (intentional second person because I am not only referring to students but also directly addressing the reader) can only find your voice through a commitment to self-reflection and the willingness to share. Telling your truth requires courage. Telling your truth requires vulnerability. Telling your truth is hard work. I told my students on Day One that everything we do in class should fall into one of these categories, and if they don’t, students can call me on that. I commit to not waste their time or my time on busy work which doesn’t matter. And my hope is my students will leave realizing these tenets are not just for AP Lit but can and probably should apply to life.